A sunny walk round Roecliffe on Good Friday brought us face to face with these lambs, doing what lambs do best: feeding, resting and being curious. 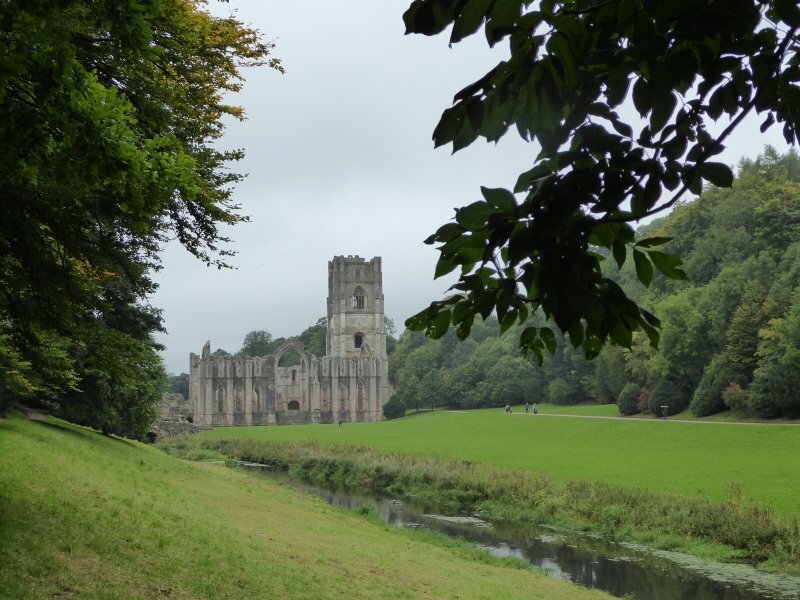 Author margaret21Posted on March 27, 2016 Categories North Yorkshire, WalkingTags Easter, spring, Walking, Yorkshire13 Comments on Lambs at Easter. You’ll know that we waved ‘Goodbye’ to Emily this week. She’s arrived in South Korea, jet-lagged and exhausted, but not so much that she can’t send snippets of up-beat information about her new life as Emily-in-Busan. While she was with us, Emily-in-Barcelona briefly became Emily-in-London, Emily-in-Bolton, and Emily-in-Yorkshire. And while she was with us, Boyfriend-from-Barcelona came to visit. What should we show someone from a vibrantly busy city, one of whose attractions is several kilometres of golden, sunny, sandy beaches? Well, on a frosty, gusty February day, with more than a threat of snow in the air, what could be better than a day beside the seaside? Whitby: the view anyone who’s been there would recognise. Whitby seemed to fit the bill. Picturesque fishermen’s cottages huddled round the quay. A clutter of narrow cobbled shopping lanes – a tourist mecca to rival Las Ramblas. A sandy beach with donkey-rides, and the chance to find fossil remains etched into the cliffs or a morsel of jet washing about on the sands. A ruined Benedictine Abbey high above the town, the inspiration for Bram Stoker’s ‘Dracula’, and the focus of a twice-yearly Goth music festival. And fish and chips. Always fish and chips at an English seaside destination. Emily and Miquel explored the lot. Whitby seen from St. Mary’s Church, next to the Abbey. The abbey and church seen from a ginnel. A close view of those cliffs. One of the hundreds of gulls, thousands of gulls, reasy to steal your fish and chips with no warning. And just before we left … a little bit of rainbow. And Miquel, windblown and chilled to his fingertips, declared that it had been a fine day out, with the added bonus of being firmly inside the car when we journeyed home across the North York Moors as the snow began to fall. Best to be back in the car when the weather’s like this. If it’s Tuesday, it must be…. Yorkshire. Goodness me. Christine and Max, our French friends from our days in Laroque arrived on Saturday, and it’s only Tuesday today. Look what we’ve crammed in…. 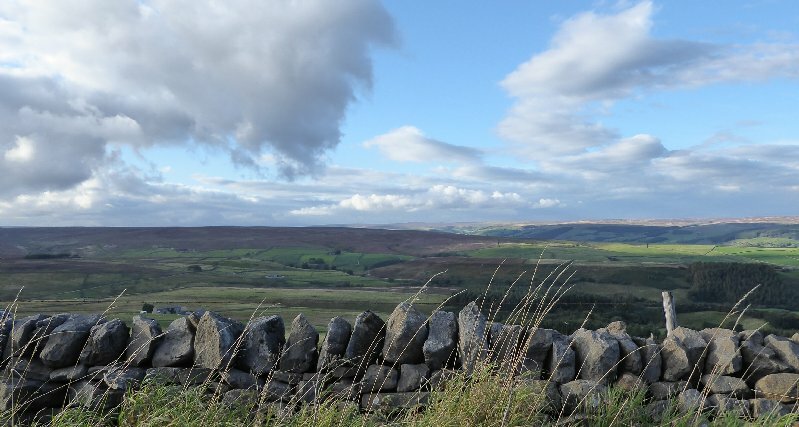 An orientation session in Nidderdale, taking in a few views…. 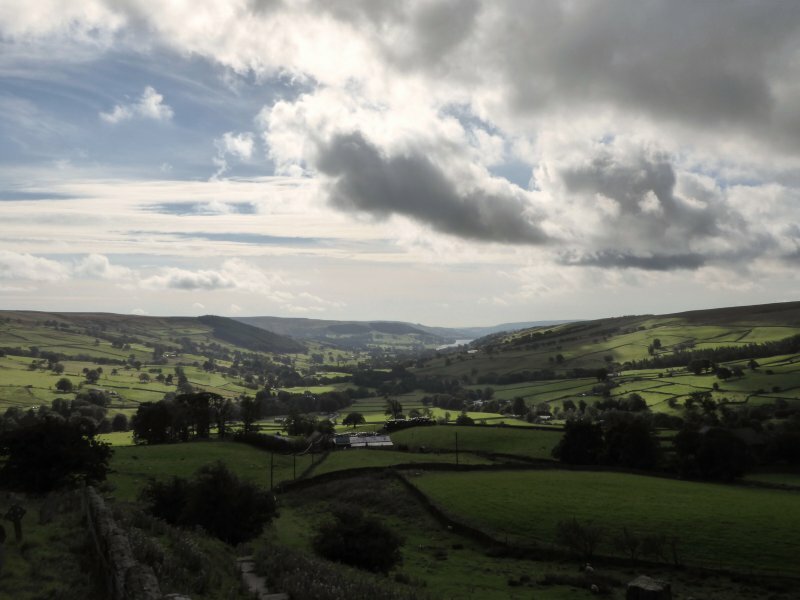 The view from Middlesmoor, Nidderdale. 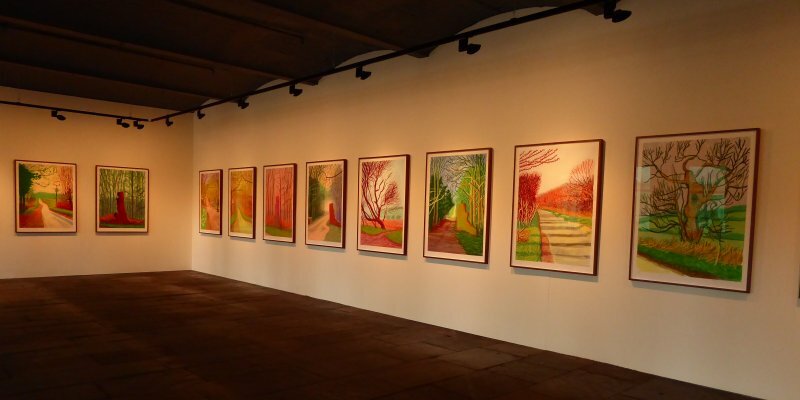 David Hockney at Salts Mill. 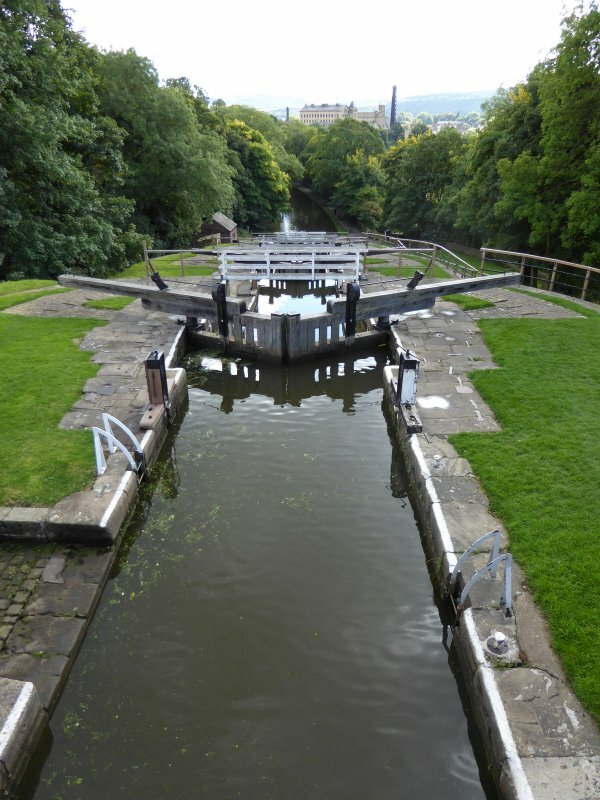 All five of the Five Rise locks at Bingley. A mooch round Haworth, home to the Brontë sisters…. 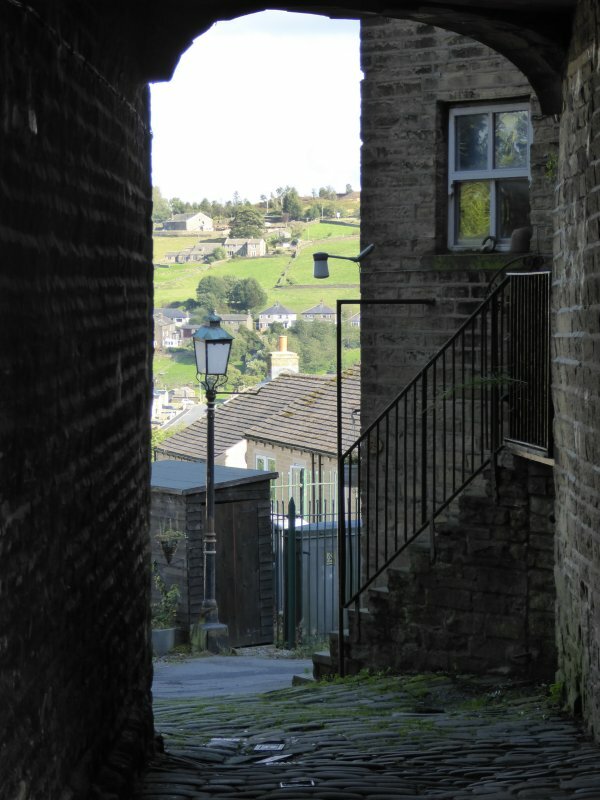 Peeking through a doorway in Haworth. And views, views, always vast, always bounded by drystone walls, always different. We’re having a rest tomorrow. Author margaret21Posted on September 15, 2015 Categories Nidderdale, North YorkshireTags Nidderdale, Yorkshire14 Comments on If it’s Tuesday, it must be…. Yorkshire. England? France? A six months review. We’ve been back in the UK from France six months now, so this seems a good moment to take stock. Did we do the right thing in coming back to England to live? Absolutely no question: we’re so happy to be here, and nearer to most of the family. There are things we miss about our lives in France though: of course there are. It was tough to leave friends behind, and we continue to miss them. Still, three have visited already, and there are more scheduled to come and see us here. And it’s sad no longer having the Pyrenees as the backdrop to our lives. Though North Yorkshire’s scenery brings its own pleasures. Still, it’s wonderful not to have to tussle with language on a day-to-day basis. Our French was pretty good, but it was generally a bit of a challenge to talk in any kind of nuanced way about the more serious things in life. Now I feel I’ve freed up enough head-space to revise my very rusty Italian, and to learn enough Spanish to get by when we visit Emily in Spain. Many of our regrets or rediscovered delights centre on food. This summer, we’ve gorged ourselves on the soft fruits that the British Isles grow so well: particularly raspberries, gooseberries and blackberries. Oh, they exist in southern France, but they’re wretched, puny little things, with no lively acidic tang like those of their British cousins. In a straight choice between raspberries and peaches, raspberries win every time (though of course, it’s even better not to have to choose). I miss, though, the choice we used to have in France of four or five different kinds of fresh, dewy whole lettuce available on market stalls every single week of the year. It’s flat, cos or little gem here, or those depressing bags of washed mixed leaves, and I find myself longing for the choices I used to have of crunchy, curly, bitter, blanched or soft leaves in various shades of green or even red. On the other hand, we do have tangy watercress here. And crisp crunchy apples, and Bramley cooking apples…..
And whereas in France there were always French cheeses on offer, and jolly good too, that was all there was, apart from the odd bit of shrink-wrapped Cheddar or waxy Edam. Here we can have English AND French (and Dutch and so on): decent French cheese too, unpasteurised, from small suppliers. And what about eating out? Surely that’s better in France? Those copious home-cooked midday ‘formules’ – often a starter, main course, pudding AND wine, preferably eaten in the open air shaded by some nearby plane trees bring back such happy memories. But, but…. the menus were entirely predictable, and were dishes that had stood the test of time over the decades. After a few years, we wouldn’t have objected to a few surprises. Whereas back in Britain, most places seem to have upped their game considerably over the last few years. Local restaurants, pubs and cafés offer interesting menus, often based on what’s available that day, at fair prices. We’ve had some great meals since our return, and we’ve hardly started to get to know the area’s food map yet. And for Malcolm, there’s the constant possibility of slipping into a tea room to assess the quality of their coffee and walnut cake. This may be the main reason why he’s come back. All the same, we can’t eat outside quite so often, particularly in the evening. And our fellow walkers have yet to be convinced of the pleasures of the shared picnic with home-made cakes and a bottle of wine: we’re working on them. Nor have we yet had a community meal, with long tables set out in the square as old friends and new share fun together over a leisurely meal. Like most people who return from France, we find the crowded motorways unpleasant. But it is nice not to be followed at a distance of only a few inches by the cars behind us. We’re struggling to shake off French bureaucracy too. Tax offices and banks over there continue to ignore our letters pointing out we no longer live there, continue to demand paperwork they’ve already seen, continue to ignore requests. And as we can no longer pop into the local office to sort things out, the problems just go on and on. Something we’re enjoying here too is the possibility of being involved in volunteering. It’s something that exists in France of course: Secours Populaire and similar organisations couldn’t function without local help. But the French in general believe the state should provide, and the enriching possibilities for everyone concerned that volunteering in England can offer simply don’t exist. We already help at a community bakery, but I’m currently mulling over whether I should find out more about the local sheltered gardening scheme for people with learning disabilities, or about working with groups of children at Ripon Museums, or simply go into the local Council for Voluntary Service and find out what other opportunities exist. Six months in, we’ve spent more time with our families, re-established old friendships, begun to make new ones. We’re happy in our new village home, and the slightly different centre-of-gravity we now have. Poor Malcolm’s waiting longer than he would have had to in France for a minor but necessary operation, but despite that, life’s good. We’re back in England to stay. Author margaret21Posted on October 5, 2014 Categories Ariège, England, Pyrénées, Ripon, YorkshireTags Ariège, England, food, fruit, Pyrénées, Yorkshire18 Comments on England? France? A six months review. We’ve just had good friends from Laroque staying for the week. We’ve been obliged to polish up our French, which turned out not to be as hard as we’d feared. And we’ve been doing our best to show-case Yorkshire. We didn’t expect that to be hard, and it wasn’t. 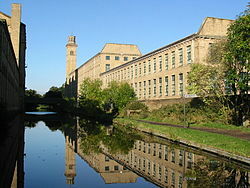 But we had fun exploring links between our two home areas, something I’ve talked about before here. Easy enough when you’re walking in the hilly limestone scenery of the Dales, or discussing breeds of sheep, or our former textile and mining industries, or bumbling along single-track roads in the country, with no villages in sight. But it would be stretching a point to find a meeting point between the land-locked Ariège, and the East Yorkshire coast, surely? Well, as it happens, no. We had a day exploring the coast near Whitby: and I remembered that during the 1800s, Whitby and parts of the Ariège, Laroque d’Olmes included, had a thriving industry in common. Jet. 19th century mourning jewellery. Wikimedia Commons. Back in the mid 19th century, the fashionable French and English alike couldn’t get enough of the gleaming, richly black fossilised wood that came out of local cliffs (Whitby) and river beds (Ariège) to be transformed by local workers into brooches, earrings and lockets. In its hey-day, the industry employed thousands of people engaged in finding and extracting the mineral, carving and polishing it. Queen Victoria ensured its continued popularity in England by wearing jet as mourning jewellery when her beloved Prince Albert died. We found no jet. So Wikimedia Commons had to help me out. Its decline as a fashion item matched the decline of readily available sources of the material. Somehow, by 1900, jet had lost its allure, and both areas lost an important source of employment. Jet in the Ariège is consigned to history books and museums. In Whitby, however, there’s something of a revival, and there are once more a few shops selling costume jewellery and other items made of jet. We never found a single piece, but not for want of trying. Instead, we had a more traditional day at the sea. We ate large plates of fish and chips. We seagull-watched. We paddled on the beach and investigated rock pools. And we ended the day at the higgledy-piggledy and charming settlement of Runswick Bay, clambering up and down the cobbled streets and admiring the quaint cottages with their views across the bay. Whitby Old Town seen from a ginnel. Fish and chips at the Quayside Fish and Chip Restaurant. Dog at play on the beach at Whitby. Cottages at Runswick Bay. It’s not raining. The flowers have just been watered. We’ve had quite a weekend. Our vaguely organised daily lives, with plenty of chances to stand and stare, or at least sit down with a cup of coffee and the paper have been shot to pieces by the arrival, for two days only, of our twin nine-year old grandsons, Alex and Ben. We had a busy Saturday, full of pancakes, playgrounds, and Ripon’s Prison and Police Museum (recommended). But the highlight of the day was Brimham Rocks. It’s an extraordinary place. There, slap-bang in the middle of the rolling and verdant Yorkshire Dales, is a 30 acre fantastical landscape. Dry-stone walled fields and charming villages are suddenly replaced by an odd collection of weird and wonderful shaped rocks. Brimham Rocks. These are formed from millstone grit: glaciation, wind and rain have eroded them into extraordinary formations, pierced by holes, balancing apparently precariously, or stacked into tottering towers. Geologists study them, rock climbers scramble up them, but above all, families come to let their children become impromptu explorers, mountaineers and adventurers of every kind. We’ve only chosen quiet times to visit here in the past, but with Alex and Ben, we had no choice, We wanted to take them there, so a brisk and breezy Saturday slap-bang in the middle of the school holidays it was. The car park was overflowing . Oh dear. But it was fine. The space is big enough to provide room for all. And it was fun to be amongst children from the smallest toddler to the tallest and lankiest of teenagers, all having an equally good time: all exploring, all testing themselves physically, weaving their own adventures. And besides, we didn’t come home empty-handed. August is bilberry season. Alex and Ben, particularly Ben, rose to the challenge of stripping the small and rather hidden fruits, becoming ever more purple as time passed. Teeth turned blue, hands indelibly stained, fingernails beyond help from any nailbrush: it was so good to see my grandchildren discovering the pleasures of food-for-free. Bilberry pancakes for Sunday breakfast then…..